When it comes to enhancing sales and service culture, Jeff Mowatt didn’t just read the book, he wrote it! This session is based on Jeff Mowatt’s best-selling business book, Becoming a Service Icon in 90 Minutes a Month. 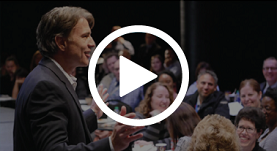 A customer service strategist and Hall of Fame speaker, Jeff heads his own training company and has written and produced 13 coaching tools. His Influence with Ease® column has been syndicated and featured in over 200 business publications. Don’t miss this opportunity to enhance your sales and service culture – in just 90 minutes a month! Still not sure this is the right seminar for your leadership team? Times: Registration: 8:30am-9am Seminar: 9am-4pm. Lunch is included. Amounts are in Canadian dollars. Group rate: You’ll automatically receive 10% off the above rates when registering groups of 6 people or more. Bonus! Each participant will receive a copy of Jeff Mowatt’s bestselling book, “Becoming a Service Icon in 90 Minutes a Month”. Enrolment is limited. To guarantee your seating register today by calling us at 1-800-JMOWATT (566-9288), within Calgary 403-244-9094. Cancellation: You may cancel up to 30 days in advance and receive a full refund. You may switch registrants at any time. If you are serious about creating a service-oriented team, Jeff Mowatt’s resource is a must. Groundbreaking! Jeff Mowatt reveals how you can take good service to the next level – without asking employees to work harder or faster. This session has had a huge impact on how I will grow into a strong leader. I will use Jeff’s examples in the actual training of our team. Guests will be happier and so will our team. Today’s presentation has me thinking we should be bringing our management team to Jeff’s seminar so they can hear and see this first hand. Jeff’s presentation was the best I’ve seen since I’ve been with the company. It was relevant to the corporate direction and to the challenges that branch managers have in moving the vision forward. The impact of Jeff’s session on my organization will be HUGE! Jeff has given me great tips on how to move my company forward. This was one of the best presentations I have attended. It will allow me to further upgrade the quality of our team. I’m the trainer for our entire company. I cannot thank Jeff enough for helping me to improve company profitability. This will open up a new approach for my team. After this training, I will be able to take our call centre to the next level. Great tools from Jeff’s seminar. Jeff’s session will impact us largely. The gaps needed to cope with the constant turnover of new staff and training new staff were filled in. I have been in finance for 30 years and Jeff’s seminar was a real enlightener for me. Jeff’s leadership strategies have been part of the foundation of developing the culture of 5B Management. Our corporate culture evolved from standard, old school management to a culture with a palpable pulse staffed with people with a passion to meet the needs of the customer. We implemented Jeff Mowatt’s customer service strategies and are proud to announce that out of hundreds of area businesses, we were recently voted by the local newspaper as #1 GOLD WINNERS for Customer Service.